Located in the heart of a port city, Fremantle College is proud of its links to the local fishing and shipping industries. 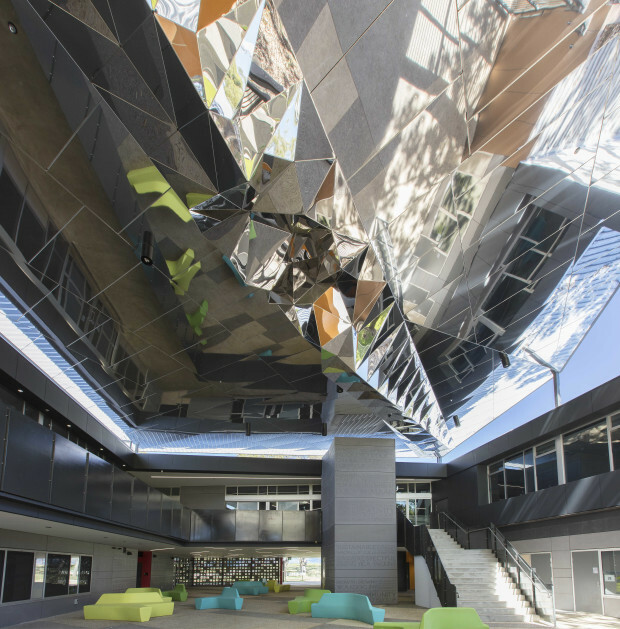 'Kaleidoscopic Wave' by artist Penelope Forlano is a series of complex 3-D swelling waves that emerge from the highly polished mirrored surface of the soffit of the covered courtyard. 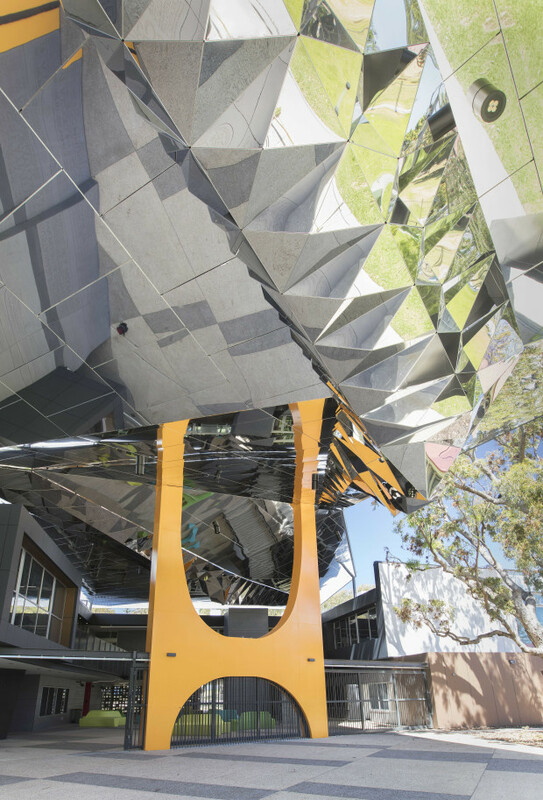 Connecting Fremantle's maritime and architectural heritage with the present and future of technology, the artwork suggests the experience of looking up from under the ocean, experiencing ever changing water ripples and fragmented reflections of light and image. 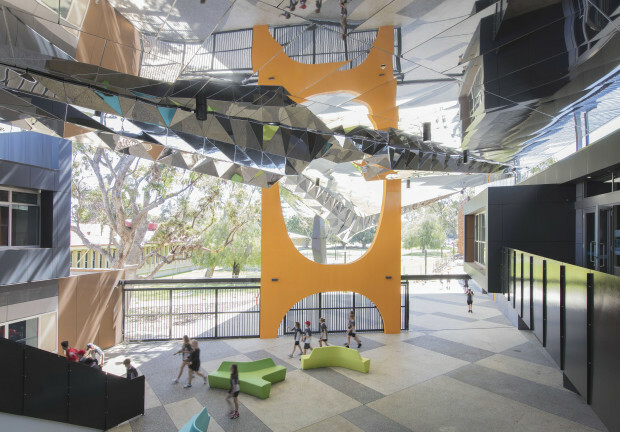 The project was publicly advertised within Western Australia and Penelope Forlano was awarded the commission from a competitive shortlist of highly experienced artists. Penelope worked in close collaboration with the architects and engineers for the project to ensure seamless integration. Employing generative computer modelling programs to design the form and the latest digital CNC (Computer Numerical Control) fabrication techniques to laser cut and fold the stainless steel with precision. Glen Oldfield from Composite Components fabricated and installed the artworks. 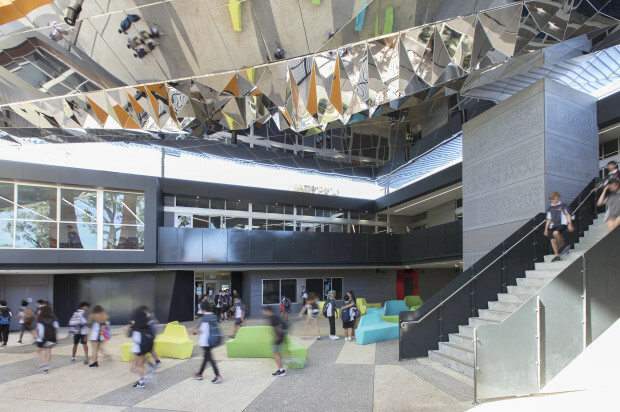 By integrating the artwork into the soffit, Penelope also celebrates the architectural and industrial heritage of Fremantle in which many 19th century buildings feature decorative pressed tin ceilings and soffits to the verandah.